Subscribers have steadily dropped for World of Warcraft over the years, but now there's been a sudden surge in subscribers. Activision-Blizzard has announced that World of Warcraft has 7.4 million subscribers as of the end of September, a 9% increase in its subscription base for the MMO from the end of June (from 6.8 million subscribers). The company believes the rise in subscriptions is related to next month's release of the expansion pack, Warlords of Draenor. Warlords of Draenor is the fifth expansion pack for World of Warcraft. The company notes there was a similar jump in subscribers in October 2012 near the launch of the last expansion pack, Mists of Pandaria. 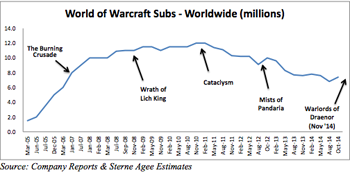 World of Warcraft subscriptions have steadily dropped over the years. The game, which launched in 2004, saw a great increase in subscribers from early 2005 to early 2008 with a smaller increase later in the year. Since the highest point of worldwide subscriptions in late 2010, the subscription base has decreased overtime. Activistion-Blizzard stated the historical subscriber trend, while declining, "is still fairly strong for a 10-year-old video game franchise." Warlords of Draenor launches November 13. The expansion takes place in Draenor, a world in an alternate universe and the home of the Orc and Draenei races. The level cap will be increased from 90 to 100. Yesterday Blizzard launched Patch 6.0.2: Iron Tide patch, one of the larger updates to World of Warcraft. It includes new character models, inventory improvements, character and class changes, and more. The patch notes are available to read here. Even with World of Warcraft's continued loss of subscribers, the game is still one of the most popular MMOs in the world.